There are quite a few options around online bookings to allow complete customisation and control over how your booking appears and operates. The site options are the basic settings for your online booking. 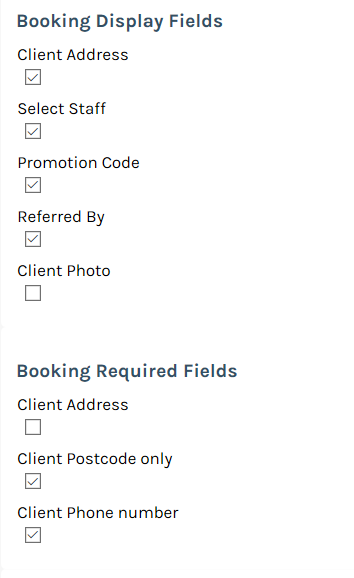 Enable Online Booking If you don't want to allow online bookings by your client turn this off. Booking Website Name This will be the url name for your mini-website. Booking Website Url If you want to have a custom domain name for your mini-website you can specify it here. You will also need to contact You'reOnTime support as we will need to do some server configuration. Default Language If you want to have a language other than English as the default you can choose Spanish or Greek from here. 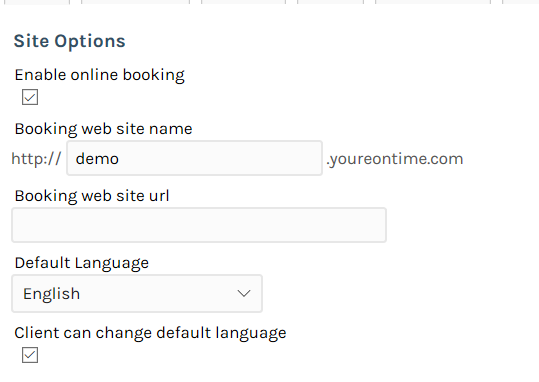 Client can change default language If you don't want clients to change the language on the booking form turn it off here. 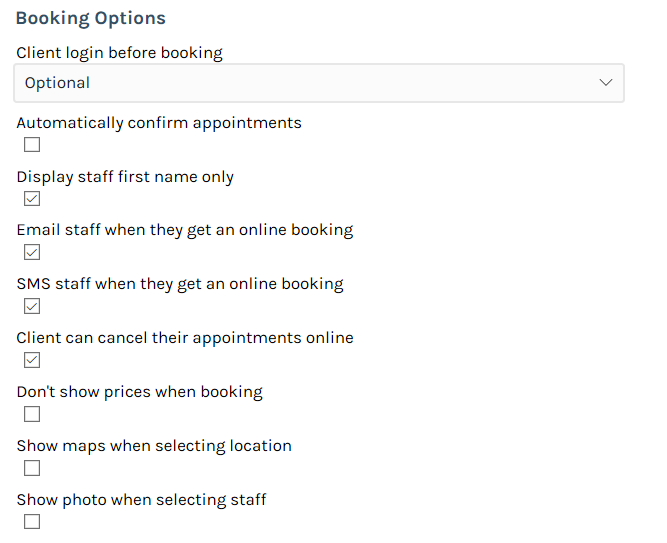 Booking options can determine the flow and options in the booking form. Client login before booking If is a good idea to allow logging into the booking form by clients. This will make sure all future bookings are all linked together under the same client record in your system, avoiding duplicates. They will be able to create their own login or use a Social login such as Facebook, Twitter or Google. Automatically confirm appointments If this is ticked when a client books it will be automatically confirmed. If you want the final say over all bookings you can untick this and online bookings will need to be manually confirmed by you when they arrive in the system. Display staff first name only If you don't want staff to be fully identified in the booking form you can opt to only show their first name. Email/SMS staff when they get an online booking Many staff like to be notified of each time they get a booking in the system. This will send them an email or SMS when they book depending on the option you choose. Client can cancel their appointments online This will allow clients to cancel online any future online bookings they may have made. Don't show prices when booking If you don't want to advertise your prices when booking or they are subject to change then you can use this option to hide them. If you want to restrict times when clients can book online there are some options here. Leave this much time after appointment when booking online If you want to leave a gap at the end of any online bookings. Booking slot interval If you want the time slots available for the client to select when booking to be different to your default appointment slots you can set them here. No bookings can be made this long before closing if you dont want bookings right up until closing time you can add a restriction here. Booking notice You may not want bookings to be made online right up to the current minute, so select a notice period they much at a minimum be made ahead of time. Don't allow booking over processing time If you don't want allow online bookings to be booked over processing time of other appointments. There are some fields which you may want to make optional when making a booking. You can have set on each service what deposit should be required for online bookings. This can be either a percentage of the price or a set value. The Deposit Type option will allow you to set this. The mini-website will allow you to also sell gift vouchers to your clients. Allow gift vouchers to be purchased online If you want to enable selling vouchers to your clients do so here. 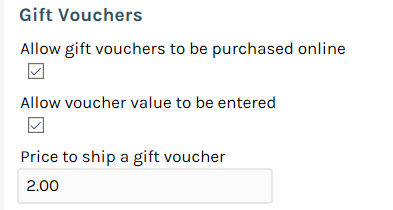 Allow voucher value to be entered If you allow adhoc amount vouchers to be sold then enable this option. Otherwise it will only allow the predefined voucher sizes from your Manage Vouchers in Settings. Price to ship a gift voucher If you charge a price to send out vouchers to clients who purchase them online then set this postage amount here. Important to note, if you sell vouchers you will need to configure a Stripe account to allow payment. This is very easy and instructions are here: Setting up Stripe. You may want to change the styles or colors of your booking to match your own website themes. 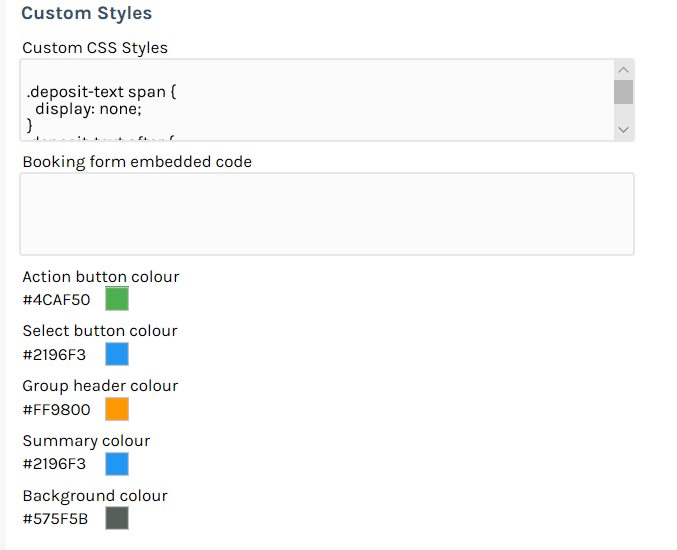 Custom CSS Styles This is some CSS code that will be inserted into your mini-website to style it. You might need help from a web developer to set this up. Colors These various colors can be changed for the booking form to match it to your site. Various emails are sent out to clients during booking online. The Email Templates tab will allow setting these up. Emails should include header If you want emails to include a basic header with your business details enable this option. Otherwise, you will be required to enter full email content. Email sent to a recipient of voucher When someone receives a gift voucher online they will be sent this email. Email sent to person purchasing voucher When someone purchases a gift voucher online they will be sent this email. Email sent to client making a booking When someone makes an unconfirmed online booking they will be sent this email. Email sent to client making a confirmed booking When someone makes a confirmed online booking they will be sent this email. Email sent to client when booking is confirmed When an unconfirmed booking is confirmed by you this will be sent to the client.